The applet illustrates one possible way of constructing the common tangents to the two circles. Like another approach, the method is based on the construction of a tangent to a circle from a point outside the circle. This uses the fact that the radius-vector to the point of tangency is perpendicular to the tangent. 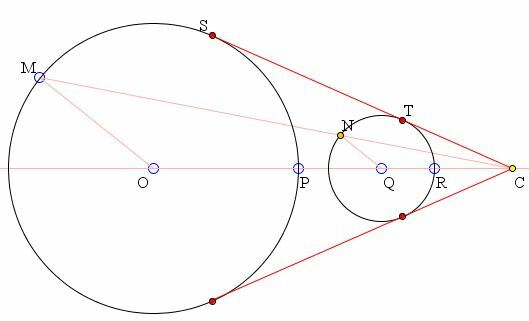 In order to find a center of similitude, choose a point (M) on one of the circles, say O, and draw a line through Q parallel to OM. The points of intersection will serve as images of M under the similarity transformation. The line joining M to either of the points will pass through through a center of similitude.